Southerners are famous (or maybe it’s notorious) for taking perfectly good desserts and amping them up to out-of-this-world delicious. Are you familiar with Krispy Kreme bread pudding? Really, whoever had that idea was nuts. This house favorite does the same thing with the old standby of Oreos and milk – think Oreo heaven. Crush Oreos (they do not need to be finely crushed) and stir in melted butter. 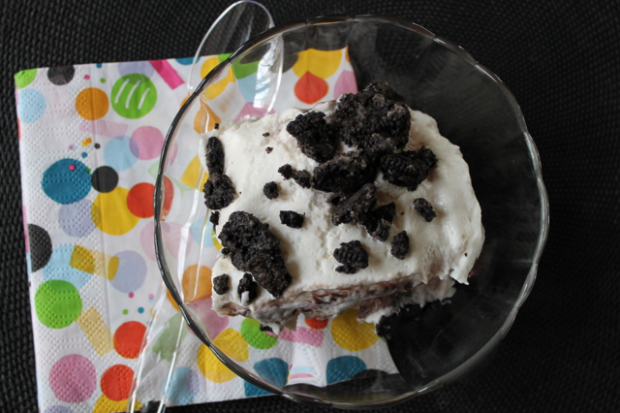 Put 3/4 of Oreo mixture in bottom of a 9′x13′ pan and spread evenly to create a crust. In your mixer beat cream cheese and sugar until very creamy. Fold in half of the Cool Whip. 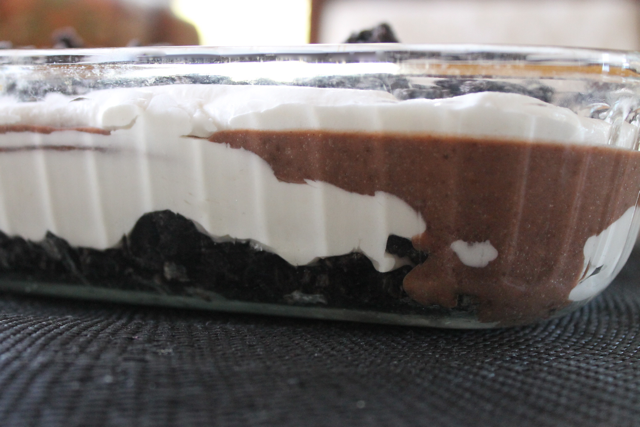 Spread this cream cheese mixture over the Oreo crust. I find it helpful to drop the cream cheese in large dollops and then gently spread them out with a plastic spatula. Next, whisk the pudding into the milk until it begins to thicken. Pour pudding evenly over cream cheese layer. Pop the pan into the refrigerator for 20 minutes to allow the pudding to chill and set-up. 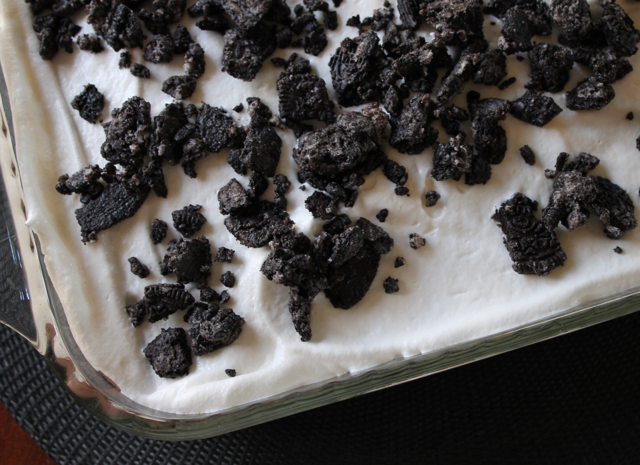 After pudding is set, gently spread the remaining Cool Whip over the dessert and sprinkle with Oreo crumb topping. Enjoy! This dessert is rich! The 9′x13′ makes enough to feed at least a dozen! Not sure about feeding a dozen. Peter and I made a heavy dent in that all by ourselves. The dessert is almost done, it’s “setting” in the fridge now. There’s just one think I’m concerned about. I took the directions to read that I need 1 package of a 6 Oz pudding. I bought 3 boxes of 2 Oz pudding and mixed with 2 1/2 milk. My mixture is REALLY thick. Did I misunderstand quantity of pudding or did i whisk it for too long? I have made this several times for birthday parties and school celebrations. I am always asked for the recipe. I usually top it with gummy worms and friends request this ‘dirt pudding’. Making it for a party tonight infact!